How Much Is a 1952 Wheat Penny Worth? The 1952 Lincoln Wheat penny was minted in a year that saw Harry S. Truman as President of the United States, and by the end of the year, Dwight D. Eisenhower was poised to occupy the White House. The civil rights movement was gaining momentum, and small strides towards equality were evolving. For example, Emmett Ashford became the first African-American umpire in organized baseball, by being authorized to be a substitute umpire in the Southwestern International League. On the numismatic front, coin collecting was gaining momentum as a hobby and as an investment strategy. The coin collecting craze launched by the public seeking rolls of rare 1950-D Jefferson Nickels continued through the mid-1950s. Numismatic News was launched as a monthly coin collecting newspaper. Collecting annual United States Proof Sets gained in popularity and sales began to soar. Coin collecting was becoming a full-fledged American hobby in 1952. The United States Mint had minted the Lincoln Wheat Penny since 1909 when it replaced the Indian Head penny. By 1952, the mint made a total of almost 37 billion Lincoln Wheat cents. James Earl Fraser, the designer of the Indian Head nickel, created a new design to replace the current Lincoln penny. The mint struck pattern pieces, however, and the newly redesigned penny was never adopted. The mint continued to manufacture Lincoln pennies with the wheat ears on the reverse up until 1958. Beginning in 1959, the mint changed the reverse to feature a rendition of the Lincoln Memorial in Washington, DC, designed by Frank Gasparro. The Lincoln Memorial reverse continued for fifty years until it was replaced in 2009 with the Lincoln Bicentennial series of reverse designs. This one-year circulating commemorative was replaced in 2010 with a reverse design by Lyndall Bass featuring a prominent shield on the reverse. Because of the sheer volume of mass-produced Lincoln cents, odds have it that there are bound to be a few mistakes. 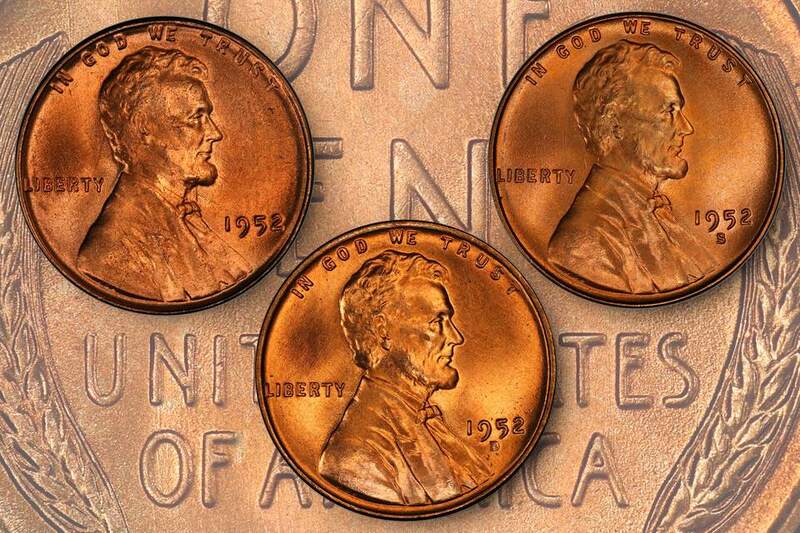 Die varieties abound and include the famous 1955 Lincoln cent doubled die obverse and the 1943 copper pennies. However, 1952 was a year that yielded only one popular die varieties in the Lincoln cent series: the 1952-D D/S Re-Punched Mint Mark (Catalog ID: FS-511). On this variety, there is a slight remnant of an “S” visible underneath the “D” mint mark. This variety carries a small premium over a non-variety specimen. Coin grading is one of the quality measurements used to determine the value of the coin. The problem is that determining the grade of the coin is not a scientific endeavor and is a matter of opinion. However, numismatists have agreed to certain criteria that help place a value on the coin. Lincoln wheat pennies are graded on a scale of 1 to 70. Where 1 is a well-worn and barely recognizable specimen, and 70 is a pristine and perfect example of the coin. You can accurately grade your Lincoln Wheat Penny by spending a little time to educate yourself on the grading standards. The United States Mint manufactured Lincoln Wheat pennies in 1952 at three different facilities: Philadelphia, Denver, and San Francisco. Each of these facilities produced hundreds of millions of Lincoln wheat pennies that year. Although these numbers sound humongous, mint personnel had time to make quality coins and well-struck examples are easy to find. Additionally, planchets of this date are also of high quality. Although 1952 Lincoln wheat pennies are quite common, uncirculated and well-struck examples in pristine condition can be worth a few dollars. Circulated examples are occasionally found in circulation today. Although, the 1952 Lincoln Wheat penny is a fairly common coin, some uncommon specimens have been sold at auction. How Much Is a 1957-D Wheat Penny Worth?